It took Nine Inch Nails maestro Trent Reznor less than a year to release a follow-up to With Teeth. Through a frenzy of USB drives, cell phones and at least 30 Web site addresses the album created a groundswell of anticipation prior to release. 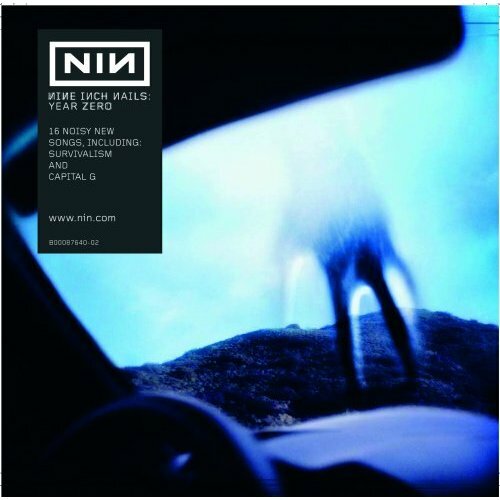 Upon first listen, this isn't my favorite Nine Inch Nails release. I actually remember cutting my teeth as a journalist writing a review for their debut album for a high-school newspaper. The keyboards that drew me to Pretty Hate Machine have gone the way of guitars for subsequent releases. On Year Zero, the guitars are dialed down a little for static and noise creation. That's a good thing. Word that Reznor was experimenting with hip-hop can me misconstrued as there are some great loops here that lay a foundation for some of the tracks and I'm sure someone could have rapped over them if they wanted. "The Warning" is a great example of this. I have to say that "God Given" is the first time that I've heard Reznor urge a sing-a-long during a chorus. The funky beat and deliberate lyrical pauses make the track memorable. "The Great Destroyer" can only be called a production experiment and although some parts are stunning, it readies the listener for the light piano piece "Another Version Of The Truth." There are still some of the expected stellar songs like "Survivalism," "Capital G," "Meet Your Master" and "In This Twilight." The landscape of the album is lush and vibrant making me only wonder how a follow-up album continuing the concept will sound.